The second generation of Apple's AirPods will arrive in the first half of 2019, according to supply chain sources, with the wearable devices expected to include health tracking functionality that will make them more attractive in the overall wearables market. 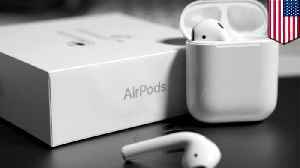 CUPERTINO, CALIFORNIA — Apple may have just dropped its much anticipated second-generation AirPods, but according to Wired, the third-generation iterations could be the real game-changers. According..